There’s nothing quite like an old-fashioned carrot cake and nobody does it better than Cracker Barrel. Today’s secret recipe will show you how to make their most popular dessert at home. This delicious cake is made with grated carrots, pineapple, coconut, cinnamon, raisins, walnuts and more. 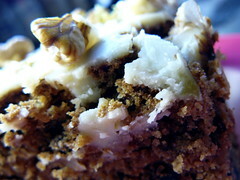 Of course, no carrot cake is complete without a rich cream cheese frosting. This cake is absolutely amazing. In large bowl mix with beater oil, sugars, vanilla and eggs until smooth and fluffy. Add pineapple, walnuts, coconut, carrots and raisins and blend well. Gradually add dry ingredients half at a time until blended through. Pour batter into a greased and floured 9″x13″” pan and bake at 350 degrees F for about 40-50 minutes (do the toothpick test). When cool, frost with cream cheese frosting. For Cream Cheese Frosting: Blend cream cheese and butter until light and fluffy. Add vanilla and a little powdered sugar at a time until frosting is light and fluffy. Spread over cooled cake and sprinkle with pecans. Today I have a secret recipe for making Cracker Barrel’s Sunday Homestyle Chicken. Boneless chicken breasts, hand-dipped in a special buttermilk batter, breaded and deep fried to a crispy golden brown. This dish is only served on Sundays at Cracker Barrel, but you can make it at home anytime. Pour 3 to 4 inches of oil into a deep fryer or large pot and preheat the oil to 350 degrees. Prepare seasoned flour by combining the flour, salt, and pepper in a bowl. Stir to combine well. In another bowl mix together the buttermilk and water. If your chicken breasts are not fairly uniform in size place them between two pieces of wax paper and gently pound them out with a meat pounder until they are more uniform in size. This will help with even cooking times. Pat chicken breasts dry with a paper towel. Season the chicken with salt and pepper and then dredge into the flour, dip in buttermilk, and then dredge again in the seasoned flour and deep-fry the chicken pieces in the hot oil. Turn the chicken breasts during the cooking to make sure that both sides of the chicken are golden brown. This should take 7 to 8 minutes for each one to cook. When the chicken is done drain in a wire rack. Many of us have fond memories of making S’mores over an open flame. At Cracker Barrel they have embraced this memory with their new Campfire S’more dessert. A fudgy chocolate brownie with a buttery graham cracker crust topped with a toasted marshmallow and melting milk chocolate. Topped with rich, creamy vanilla ice cream drizzled with dark chocolate sauce. Use today’s secret recipe to enjoy this decadent dessert at home. 3 Veggies That Melt Away Stomach Fat? Preheat the oven to 350 degrees. Make the graham cracker crust by mixing together the graham cracker crumbs, sugar, cinnamon, and melted butter in a large bowl. Stir until well combined. Line a 9 x 9 inch baking pan with waxed paper or parchment paper. Make sure the paper is larger than the pan, you will later lift the brownies out of the pan when they are done. Press the graham cracker crumbs into the pan. Place the pan into the oven while you are making the brownies. Prepare the brownies by sifting together flour, cocoa, baking powder, and salt. Melt butter in a 10 – 12 cup saucepan over moderate heat. Stir in sugar and vanilla, and add eggs one at a time. Stir in dry ingredients, and stir in nuts. Spread smoothly over the graham cracker crust. Cook the brownies for 23 to 25 minutes. Allow the brownies to cool in the pan. When the brownies have cooled completely, gently lift them out of the pan. Cut the brownies into 9 equal portions. When you are ready to serve the brownies, top each one with a large marshmallow and place the brownie under the broiler in your oven. Cook for a few moments until the marshmallow begins to brown. When the marshmallow has browned remove it from the oven, and then top with 1/2 of a Hershey bar. Serve with vanilla ice cream, and top the vanilla ice cream with chocolate sauce. I hope you have a wonderful Thanksgiving tomorrow with all of your loved ones and of course enjoy all of that amazing Thanksgiving food. Would you like a free cookbook? Make sure you look out for Friday’s email with our Black Friday cookbook sale where we’ll be giving away Volume 1 of America’s Restaurant Recipes for free! Today I have a secret recipe for Cracker Barrel’s bread pudding. This classic dish is made with dumplings, sugared pecans, plumped raisins and drizzled with a creamy caramel sauce. This could be a great addition to your Thanksgiving desserts. For pecans: In small skillet combine butter and oil, over med-low heat, with pecan pieces. Stir only till heated and barely bubbly. Sprinkle with sugar. Stir briskly only till sugar dissolves, on low heat, as these will burn quickly so work fast. Dump them into paper towel lined plate and spread out to cool while you prepare the rest. For raisins: In small saucepan combine raisins and boiling water. Cover pan with lid 20 minutes. Drain and discard water. Add coconut to raisins, set aside. For dumplings: In Dutch oven combine water and sugar and bring to boil. While you wait for that to boil, combine in medium bowl, Bisquick, milk, sugar, stirring with fork to< moisten to a thick dough. When water come to boil, drop dough by rounded tablespoonful into boiling water, making about 14 dumplings. Cover pan with lid. Simmer dumplings very gently 20 minutes. Uncover and let cook another 10 minutes gently. Baste often in the liquid, which is now becoming thickened and creamy looking. Remove pan from heat. With slotted spoon remove half of dumplings to greased 8″ square baking dish. Sprinkle with pecans and raisins/coconut. Arrange rest of dumplings over that and set aside. Save dumpling liquid. For caramel Sauce: Strain remaining liquid from dumplings into heavy 2 1/2-quart saucepan and bring to boil, stirring constantly. Add brown sugar, stirring vigorously, over med-heat till it boils briskly 2 or 3 minutes or till sugar is completely dissolved and sauce drops from spoon in large drops rather than like water. It should be the consistency of smooth gravy. Spoon sauce over dumplings, filling dish right to the rim. Cool 15 minutes. Cover; refrigerate to serve within few days. Micro warm servings or use cold with a scoop of ice cream on top of each.